Before I continue with my post, I would just like to say how saddened I was about what happened in London yesterday. We should be very proud of the emergency services, as well as all the people who did their best to help the injured. In the midst of horror, there is good. It seems a little inappropriate to continue with a post about jewellery, but I had planned to do that today, so I shall carry on as normal. 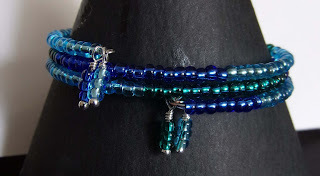 I have been making (well, constructing) jewellery for a few years now and have enjoyed learning new skills such as macrame, kumihimo and using polymer clay. Initially, I made jewellery using larger sizes of bead/gemstones, around 10mm or 12mm. However, as time has gone on, I have reassessed what I like and realised that I actually prefer smaller stones/beads, so I have been making a few simple elasticated bracelets for myself using those smaller stones. Above is a beryl bracelet, in pastel shades, using 6mm gemstones with sterling silver spacer beads. Then there is a Burmese jadeite 6mm bracelet, again using sterling silver spacers. Simple, but pretty and very easy to wear. I was looking at some bracelet designs on the internet (as you do) and saw one made with memory wire and seed beads, I didn't think I was that keen on seed beads (as I had become a bit of a gemstone snob - only the real thing, thank you) but when I searched some of the bead shops, I was impressed by the colours and prices. 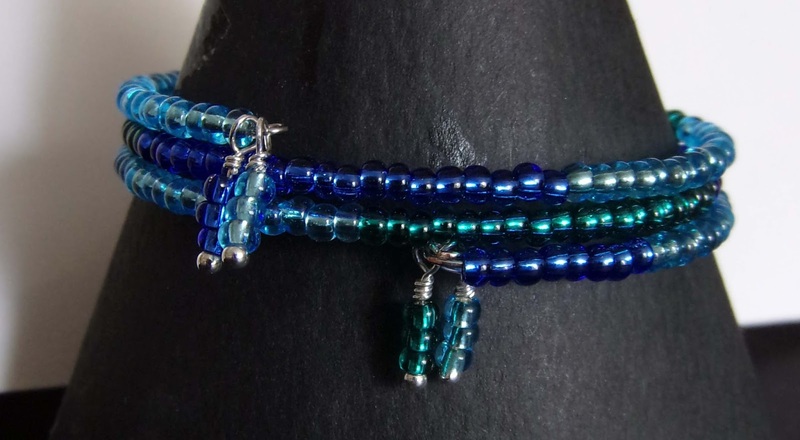 So, I placed an order and made up a couple of bracelets in my favourite colours. I am really pleased with how they have turned out. They are easy to wear - you just coil the memory wire around your wrist - and there they sit. I made some little charms just to finish off the ends nicely. The one above is my favourite as it looks like a stacker bracelet when it is on, but is all one piece in reality. 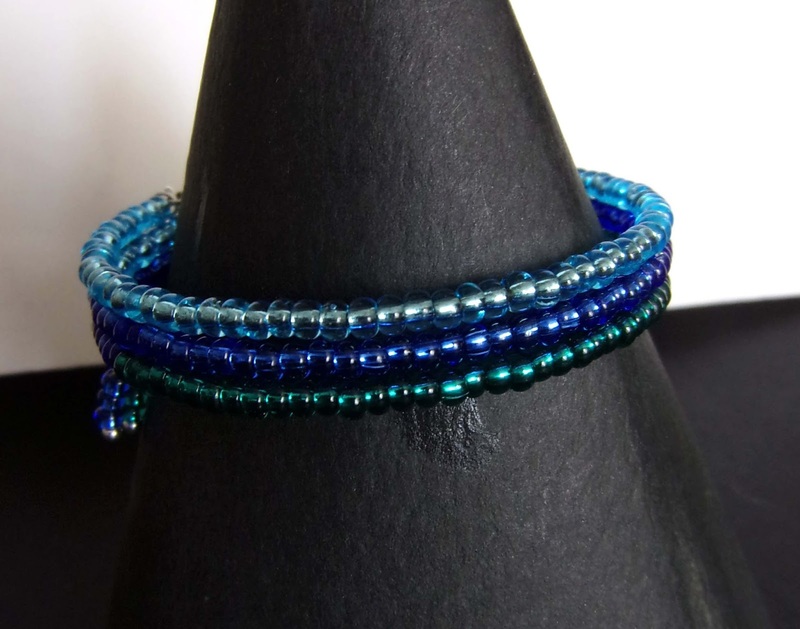 I have since order more seed beads, and feel that several more of these bracelets will be created very soon! Love your creativity. And the fact that it isn't static, but shifts as you learn. The world aches with you after this latest atrocity. Thanks, EC. I think it is all down to different tastes as I mature (!). I do love having creative opportunities and enjoy learning new things. Hatred in the world continues, in its many forms. 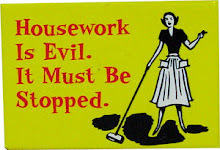 All we can do is to continue standing against it. very pretty! I love the dangles on the memory bracelet. It's a slippery slope with seed beads... you'll be beadweaving before you know it and then have a house full of the things!